"Kennon: Road to Global Peace and Unity"
・It depicts the dawn of discovery of the mountain gorge passages to the land of Kafagway, above high rise mountains from the torrid plains of Pangasinan and La Union Spaniards, German and American. ・It depicts too the construction to the Benguet Road with almost 4,000 workforce to reach Baguio to realize the dream of American citizens working in the torrid plains of the Philippines. 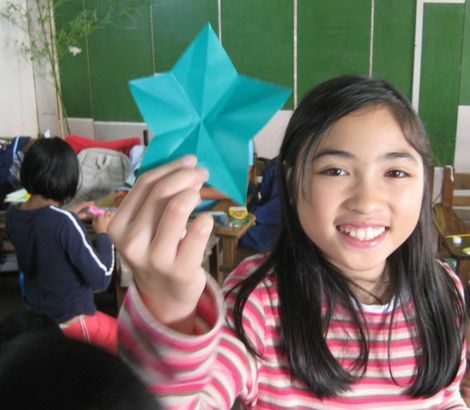 ・It relate too the construction of the City of Baguio and its impact to the people not only in the Cordilleras but from the lowlanders and foreigners. ・It relates conflicting events borne by the WWII. ・It give fuss in the human value that is developed by the Kennon workforce that would positively affect the world’s human relation. 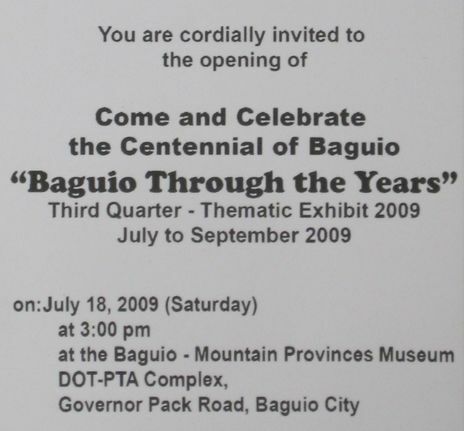 ・It advocates for the making of Baguio & Kennon Road as international heritage that needs planning and doing. Is this heaven? Spirits, look live angels, are here. 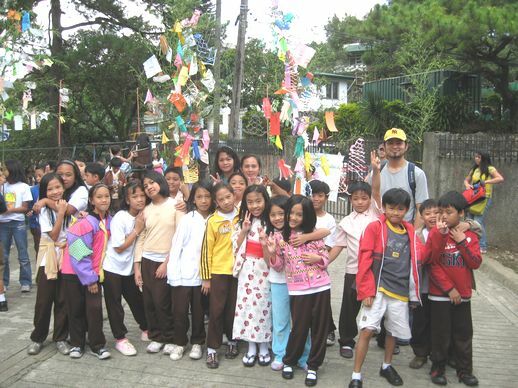 Showing the different nationalities who work at Kennon Road and Baguio City. a.All in movements depicting the arrival at Kennon Road. b.Depicts all how they work. 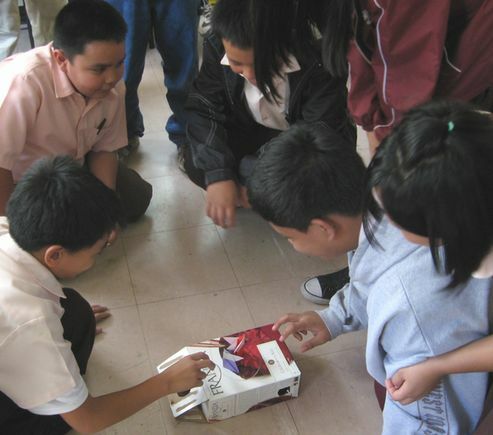 c.Depicts their next destination after Kennon Road. Some build buildings, some work is the mines, some in the farm and in sawmills. Other depicts their work in Mt. 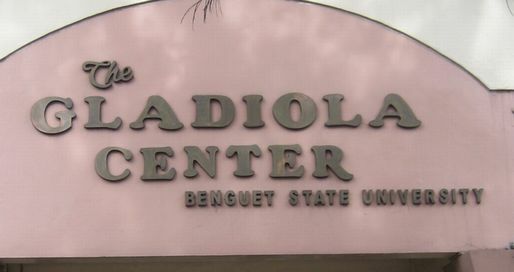 Province particularly Sagada and Bontoc. d. Everybody enter with the paintings of their masterpieces like buildings, bridges, and houses. 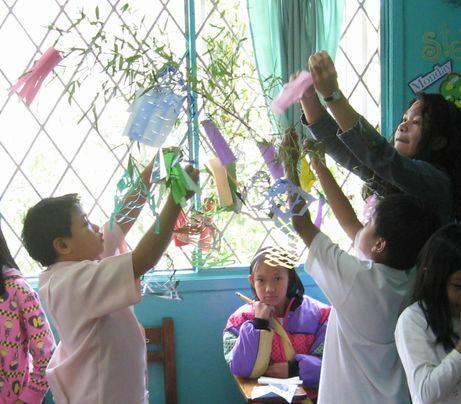 IGOROT SPIRIT： Emergency! Hey! 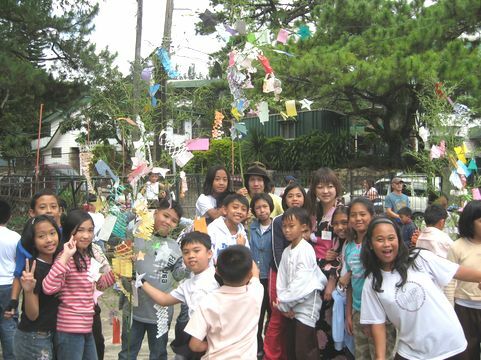 They will cut the holly pine tree in Baguio! 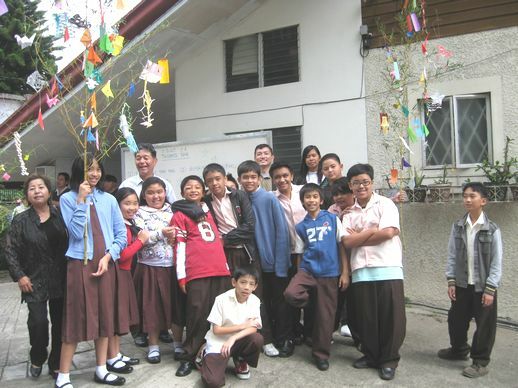 CHINESE SPIRIT： That shopping mall group presented a plan to open up their new branch in Baguio. AMERICAN SPIRIT： Nature will disappear again. At the Kennon Road View Point. Adelaida and Johnny enter with a picture. ADELAIDA ：Truly I come to believe, its beautiful,　The things you told me before. Now I see it with all my soul. For good reasons, we are here to rebuild it. Shima sings her adoration to the heroic deeds of the labor force and the sacrifice of Japan families who allowed their sons and husband to earn in a far away land. As she sings choreography is to be done to elaborate the meaning of the song. 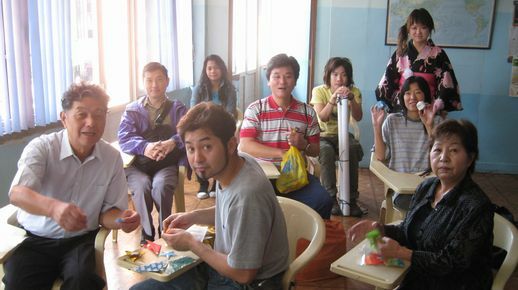 The parting of Japanese families from their son and husband who has to leave for work in the Philippines. Josephine talks with Adelaida by her cellphone. They are at different places. Josephine is under the holly pine tree. JOSEPHINE：My ancestor and your father were friends. 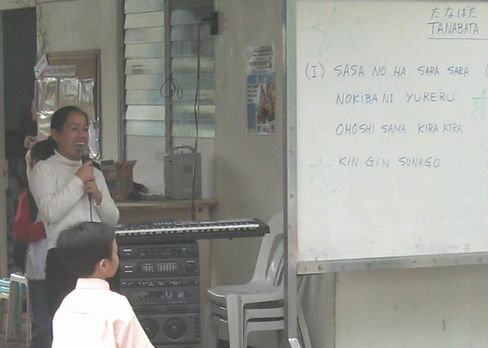 Shima sings. Toshio follows. And Josephine happens to know the song and she also sings. Adelaida takes out her picture. There are two same pictures. 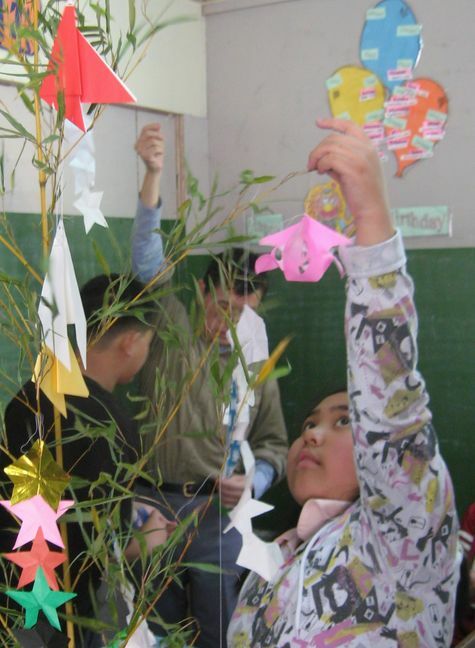 All in movements to compare the pictures and Josephine and Toshio move to under the holly pine tree. Josephine and Toshio hold hands with each other as in the picture. Johnny, Adelaida and Shima get away from the two and compare the view with the picture. 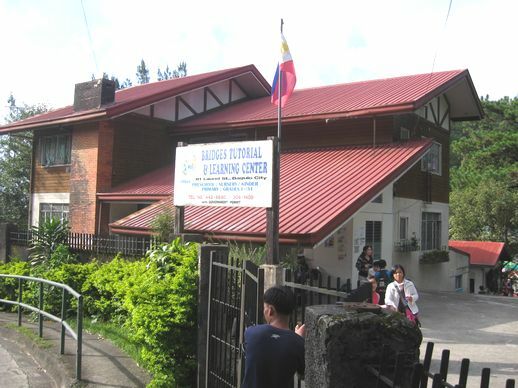 The building of the City of Baguio went along with the construction of Kennon Road and while the physical project was being done, there is also the building of society of unity and peace among the 4,000 workforce. Marriages within the different races was inevitable happening that brought a closer community relations in the work area. There are sentiments of belongingness to such international society that is still felt by descendants up to this time. 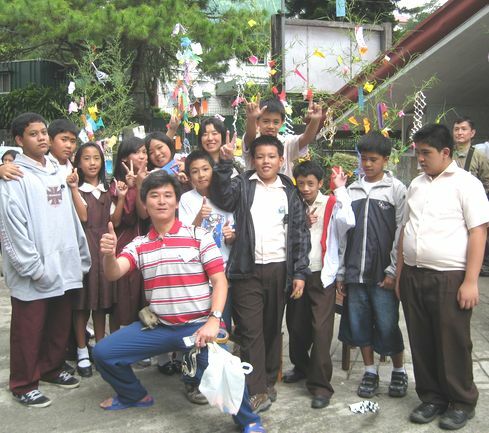 Memories of the labor force experiences lingers now and then to these who appreciate how Kennon Road came to be and how was the short live international community disrupted by the end of construction and the WWII. The early life of Ibaloys who were cattle raisers, gold panners, traders and agriculturist. AMERICAN：Yeah, Benguet Road. 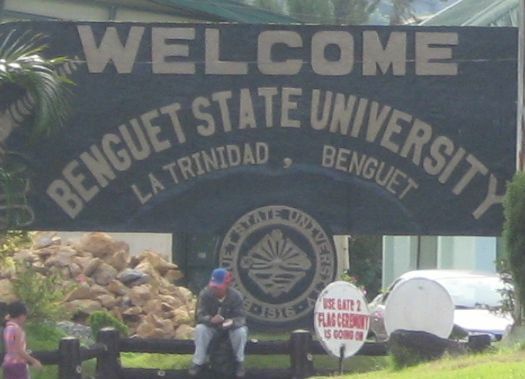 We’ll construct the Benguet Road. Who I am, where I come from. I’m here to know my name. All the visions I now behold the names of long ago. It’s the name my mother once said. BAGIW：The different nationalities of the labor force arrived after the recruitment has been accomplished. The financial cost was $ 2,000,000.00, large enough to provide good food, good pay and good organization, Twin Peaks become a new community of laborers. BAGIW：There were incidents where a father and son died the same day. A road is open now! Now we work once more in unity. In the market place. Different Races, they are all in the market place after Sunday Church services greeting each one. AAA：(Compare picture and holly pine tree) This holly pine tree. BBB： Yes, it’s our mark. They wright a message to back of picture. And they exchange it. Sound of a bell in a church. Everyone is praying silently for the victims of World War II. Bagiw and other spirits comes out one by one. BAGIW： the promises of your ancestors gave a life to me. SHIMA ：　Who are you ? Spanish spirit ： Bagiw is a fairy of this pine tree. Johnny ：This pine tree ? Igorot spirit ：And a guardian angel of nature. BAGIW： they are the spirits of Kennon Road work force. Adelaida ： Yes, they are. Japanese spirit ： However, BAGIW would disappear 100 years later, if the promise of your ancestors are not achieved. 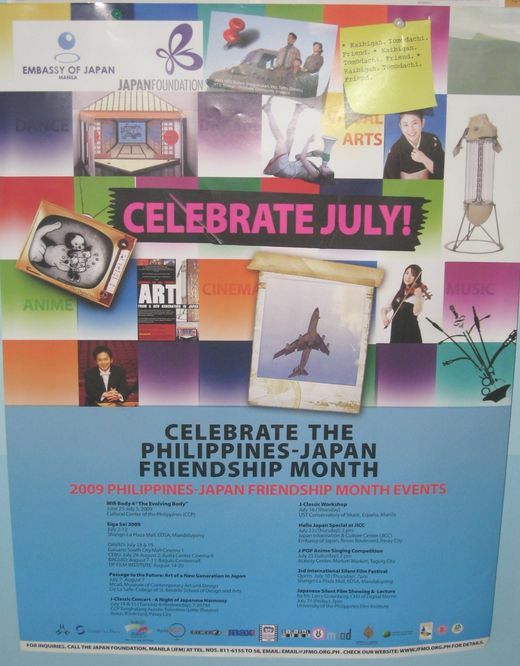 The name of September 3, "General Yamashita Surrender Day" is now changed to "Filipino-Japanese Friendship Day", announced by Baguiio Centennial Commission. 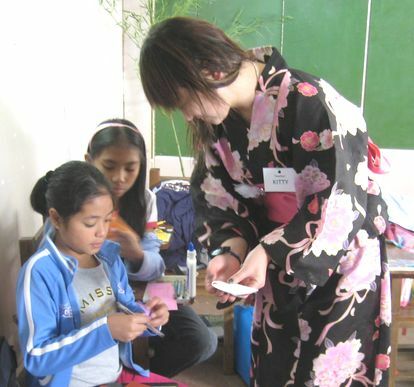 Japanese Association in Northern Luzon, Inc.(JANL) has started last September 2008 to prepare for the Japan-Philippine International Theater Art Festival for the day of September 3, 2009, and now, we would like to appreciate the Baguio senior citizens' initiative to make it happen. 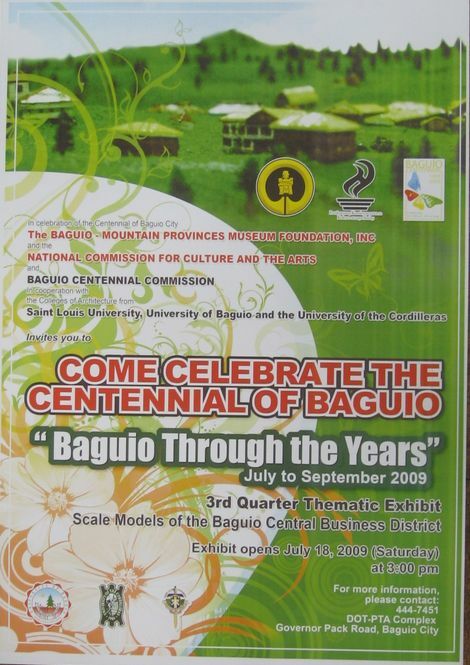 in celebration of Baguio Centennial, organized by JAPITAC/JANL. 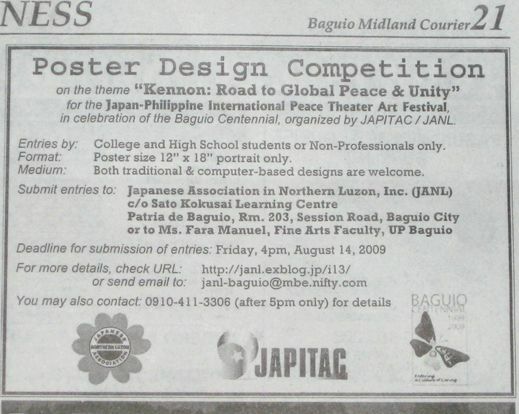 Entries by: College and High School students or Non-Professionals only. and will be featured in the JANL website. Format: Poster size, 12” x 18” portrait only. Medium: Both traditional & computer-based designs are welcome. For traditional media, original works are required. CD-ROM, in 300dpi, .TIFF (Photoshop) or .EPS format (Illustrator). private sectors and individuals, etc. 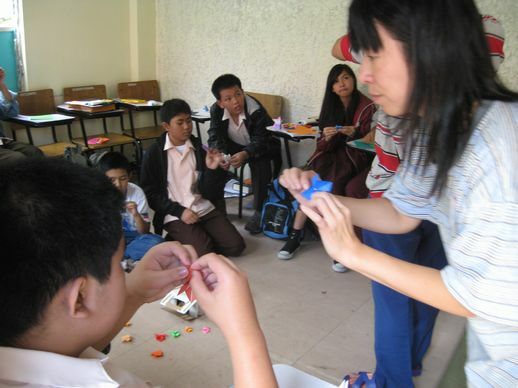 Ms. Janet B. Mede, Dramatics Club Coordinators), joined JAPITAC. The training and rehearsal program is being coordinated by Mr. Toshihisa Yoshida, Theater Art Director from Japan, and Mr. Ventura Bitot, with the assistance by JANL. 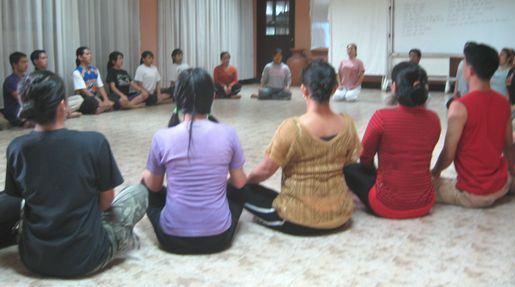 several services to support the production of the play. the international labor force that built the famous Kennon Road. 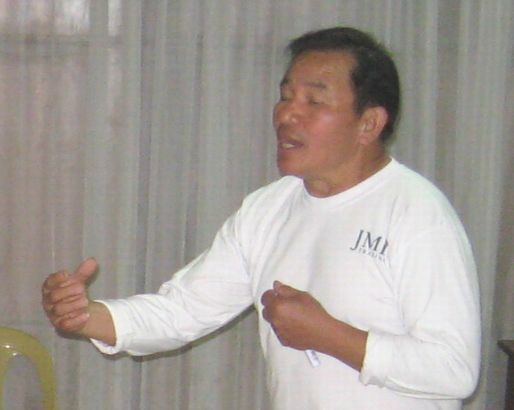 leader who fought for his ancestral ownership over Camp John Hay, a U.S.
Heritage for Global Peace and Unity. 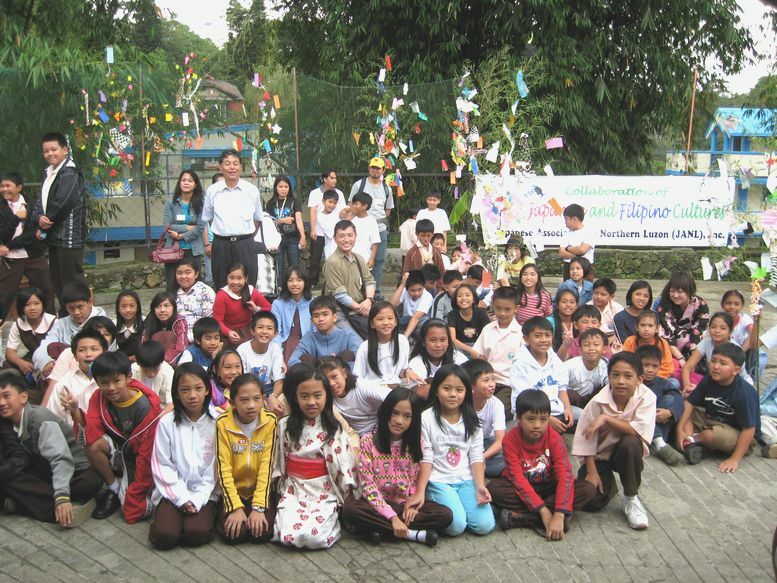 Road to Global Peace and Unity"
Written by : Ventura Bitot/Obon Di Malayado, Inc.
Japanese Association in Northern Luzon(JANL), Inc.
Filipino-Japanese Foundation of Northern Luzon, Inc. 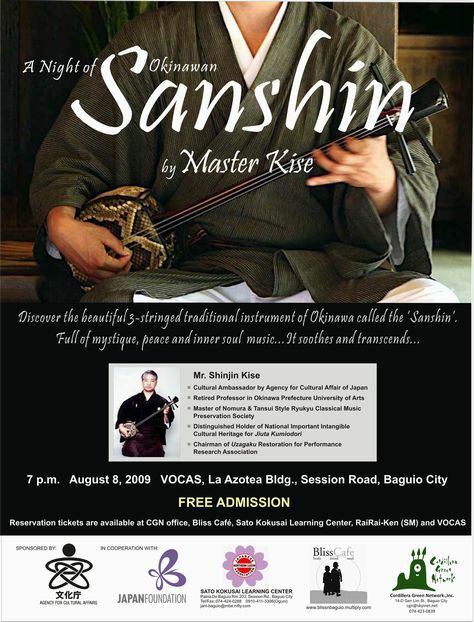 Please see below for the profile of Master Kise. - Cordillera Green Network , 14D, General Luna St.
- VOCAS, Top floor, La Azotea Bldg., Session Rd. 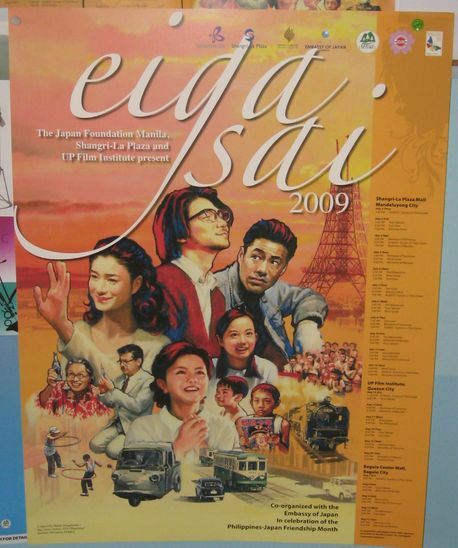 Japanese Film Festival to be shown from August 7 to 11, 2009. Will you please post it to your nearby shops and restaurant, etc ? If Yes, please contact　JANL office (c/o Sato Kokusai) at 074-424-0288 and pick up the posters and flyers. 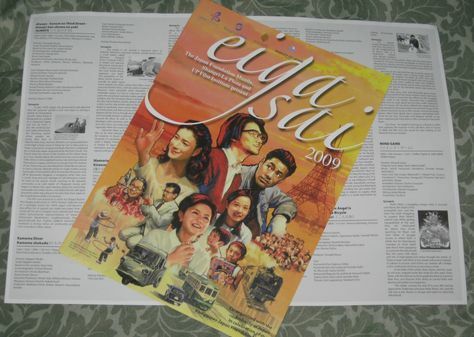 RESERVATION TICKETS for each film will be issued by Baguio Center Mall Cinema. 2. Name of your group, class, school, etc. 3. Date & Time of the Film that you want to watch. 4. The Title of the Film. 5. Number of people who needs reservation. Please send your email by August 5(Wed) for RESERVATION to secure your seats. For more details, please check this page.